Friday nights at Amite High School are sacred, full of rituals passed on from fathers to sons who play football for the Warriors. Seniors are first in line for pre-game suppers of fried chicken and mashed potatoes. The team naps in the locker room for an hour before donning pads and uniforms for kickoff. Talking is forbidden on bus rides to road games. Alden Foster observed these rites as a player two decades ago and embraced them when he returned to coach the team this season. Yet just by coming back, he broke new ground at the school. In March, Foster won a court fight to become the first black head football coach at the school in Tangipahoa Parish, a mostly rural area where schools desegregated in 1969. It was the first time since 1978 that a black man became a head coach of a high school football team in Tangipahoa. A federal judge had to order local officials to do it that time, too. Foster's hiring threatened to further divide a city of roughly 4,000 split about equally between blacks and whites, a town with a history of racial tensions. One group apparently not distracted by the controversy was his players. Amite finished its regular season 9-0 and has won its first two playoff games. In 11 games, the Warriors have outscored opponents 423 to 116. Two more playoff wins would send them on a 75-mile bus ride South to New Orleans for the Class 3A championship game at the Louisiana Superdome. "Time is the healer of all things," Foster said recently. "Winning helps, too, but kids sometimes have to show adults how to get along." Eight months ago, a federal judge in New Orleans ruled the parish school board violated a 1975 desegregation order when it passed over Foster to hire a white candidate. Foster inherited a team that went 10-3 last season and advanced to the semifinals. He would have faced intense pressure even if he hadn't sued. "Coaching at Amite is like coaching at Notre Dame," he said. "This is the pride of the town, so it would have still been that same pressure to win because you're Amite High's football coach." John Williams knows the feeling. A settlement in 1975 required the district to fill all vacancies with black teachers and coaches until they accounted for 40 percent of its systemwide faculty. Two years later, a judge held the district in contempt for failing to meet the required ratio for coaches and ordered Hammond High School to hire Williams as its head football coach. On Nov. 14, Williams visited Amite and took a seat on the visiting side of the field to watch Foster lead his team to a 43-34 playoff victory. The Warriors, who won a second-round game last Friday, host a quarterfinal game this Friday. "As good a coach as he is, he's got to win," Williams said of Foster. "If you don't win soon, and often, you're going to be forced out. There's no second, third or fourth chances." After Williams' court-ordered hiring, Hammond High lost some of its white players to a local private school. After five years and two winning seasons, Williams said, he was pressured to step down as head coach but allowed to stay on as the school's athletic director. "They wanted a white coach to come back, to get more whites back into the program," he said. "I had a good run. I didn't fight it." Foster, whose team is predominantly black, said he lost just one of his white players after he was hired. The player practiced with the team all summer but enrolled at Oak Forest Academy, a nearby private school, on the first day of classes. Michael and Michele Sevin, whose son, Eric, is Amite's starting fullback, said someone from Oak Forest tried in vain to persuade them to switch schools after Foster was hired. Jason Brabham, Oak Forest's athletic director, said he isn't aware of any efforts to recruit Amite players after Foster was hired. Foster, who played fullback at Southern University, was a head coach in neighboring St. Helena Parish when he applied for the job at Amite High. In January 2007, the Tangipahoa Parish school board passed over Foster to hire Mark Vining, a longtime Warriors assistant coach. Foster sued several months later, alleging racial discrimination. The district said it used a court-approved set of objective criteria to determine that Foster wasn't qualified. School officials also said the parish has grown progressively whiter since the 1975 order, while its pool of black applicants has dwindled. U.S. District Judge Ivan Lemelle sided with Foster and gave him the job that Vining held for one season. Vining, an Amite city councilman who now serves as the school district's athletics coordinator, said he hasn't spoken to Foster since the court ruling but doesn't harbor a grudge. "I could have thrown a ruckus and stirred up the community," Vining said, "but I didn't see any need for that." Some people, it seems, didn't need any prompting to make their feelings known. Pat Morris, president of the local NAACP branch, said she received threatening phone calls at her office after supporting Foster in his court case. "You have people here who just don't want to change," Morris said. Mark Spitale, an employee at Guy's Oyster Bar in downtown Amite who played for Amite when the Warriors won a state title in 1999, said Foster's court case seemed to divide fans along racial lines. "A lot of the older folk, I guess they think it's still the '50s here," Spitale said. "He's obviously doing something right. He's doing a lot better than people were saying he was going to do." Foster said his players made him feel welcome, even if some outsiders didn't. "Your name is dragged through the mud," he said. "Not toward me directly but toward the people spread around me." The turmoil hasn't dampened the town's enthusiasm for Warrior football. During practices, parents watch from the sidelines as Foster and his assistants run players through drills. Several hundred people follow the team on road trips. Some are tailgating before the team buses arrive. "There's still animosity, but that's going to happen," said offensive coordinator Gary Lewis, who coached under Vining and stayed on under Foster. "People will get over it. 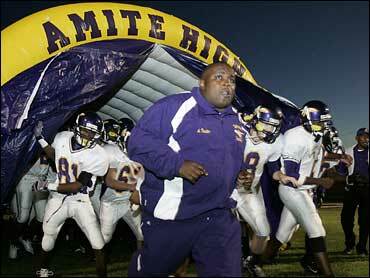 Amite is going to have a football team no matter who the coach is." Amite won state championships in 1994, 1999 and 2004, feats recorded on a sign that overlooks the Warriors' football stadium. Foster is trying to break that pattern of five-year breaks between titles. "A state championship would just be a big relief for the entire town," he said.